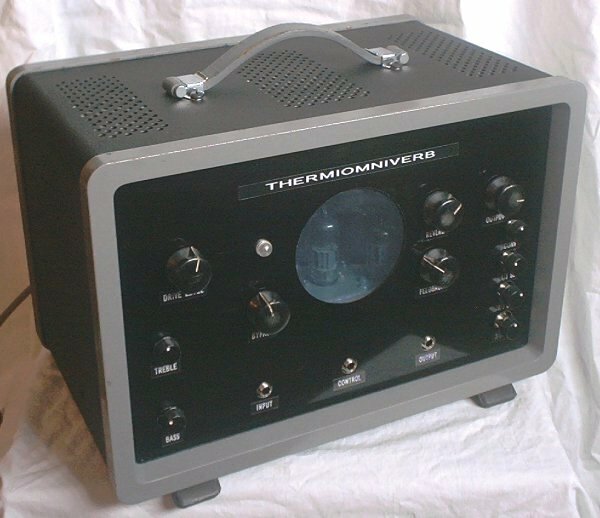 The Thermiomniverb is a reverb effects unit that The Peasant built for evaluating different transducers and spring material. It gets it's name from it's use of vacuum tube electronics combined with multiple reverb paths. 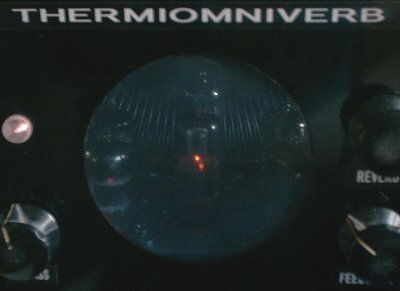 ThermionicOmnichannelReverb was a bit too long, so Thermiomniverb it is! Some of the features included in the design are frequency response controls in the drive circuit, voltage controlled wet signal level, separate preamps for each reverb spring, adjustable dry signal bypass, and adjustable wet signal feedback. 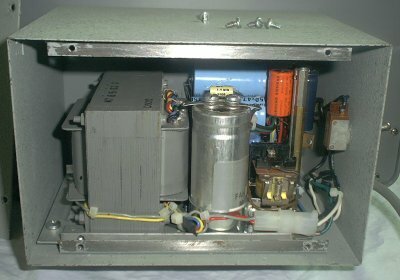 The unit was built in an old RF generator chassis, with the power supply attached to the back. 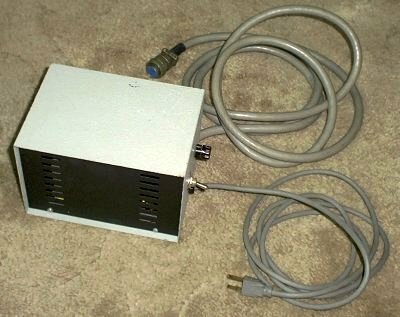 The power supply was later removed and made fully remote with a long cable to minimise hum, as shown in this picture. A window through which to see the six vacuum tubes was considered essential. Some of the reverb springs are visible inside as well. The front half of the chassis contains the electronics, while the various reverb springs are mounted on a spring suspension frame in the rear. The device has a capacity for four different reverb spring/transducer systems to be compared or mixed together at all times. 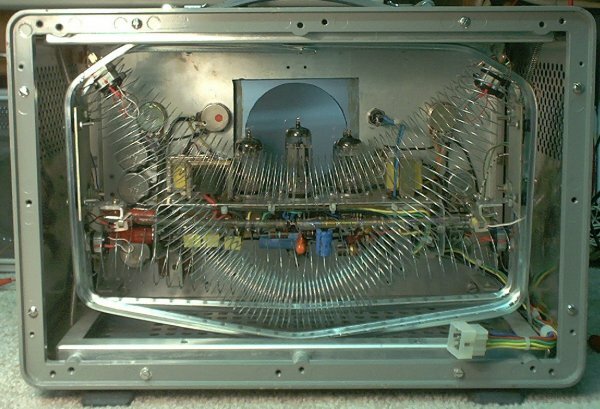 Currently the Thermiomniverb is equipped with one conventional reverb spring and three slinky jr. springs of different lengths. Placing all six tubes so that they could be seen through the window resulted in some fairly high density wiring as you can see. This is a chart of the basic signal flow of the Thermiomniverb. The configuration is equally applicable to tubed or solid state circuitry. This is the "current" circuit configuration of the Thermiomniverb. This may change over time as experimentation continues and improvements are made. To see other work that The Peasant has done with reverbs, go to theSlinky Spring Reverb page. To see further work with slinky reverbs by Grant Richter and The Peasant click here.